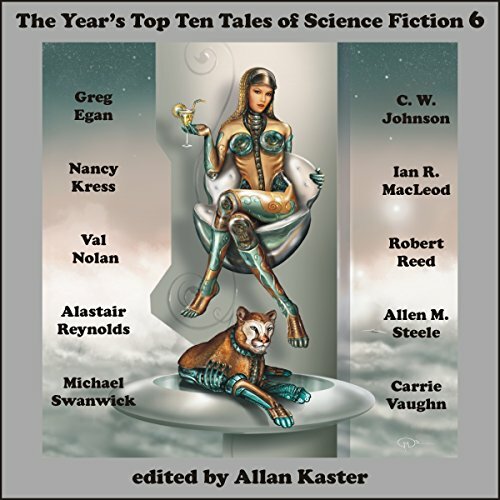 This is an unabridged audio collection of the "best of the best" science fiction stories published in 2013 by current and emerging masters of the genre, edited by Allan Kaster, as narrated by top voice talents. In "Zero for Conduct," by Greg Egan, an Afghani teenager, living in a near-future Iran with her exiled grandfather, makes a game-changing superconductor discovery. A young girl struggles to survive on a planet, with a stringent class structure, where Doors are used to go off-world in "Exile, Interrupted," by C. W. Johnson. "Pathways," by Nancy Kress, follows a teenage girl from a small Kentucky mountain town, in a near-future U. S., struggling with her family and culture as she seeks treatment for Fatal Familial Insomnia. In "Entangled," by Ian R. MacLeod, an Indian woman, in a Britain turned upside down by a disease that links people's minds, searches for answers to her personal catastrophe. In "The Irish Astronaut," by Val Nolan, an astronaut brings the ashes of a colleague, who dies in the Aquarius disaster, to Ireland for final burial. In "Among Us," by Robert Reed, a government agency goes to extraordinary lengths to identify and track the aliens among us. "A Map of Mercury," by Alastair Reynolds, showcases the plight of a failed artist dispatched to retrieve an artistic genius from a collective of cyborgs parading across the face of Mercury. In "Martian Blood," by Allen M. Steele, a researcher from Earth goes on an expedition into the untamed regions of Mars to extract blood from its natives. "The She-Wolf's Hidden Grin," by Michael Swanwick, set in the same milieu as Gene Wolfe's "The Fifth Head of Cerberus," follows the childhoods of two sisters on a planet far from Earth. Finally, in "The Best We Can," by Carrie Vaughn, a frustrated scientist pursues first contact among an apathetic populace. One of the narrators was so irritating as to make the story unlistenable. Others were fine.